Spring is finally here. The water temperatures are rising and fly hatches are increasing daily, fish are starting to come to the top in numbers to take advantage of the buzzers, olives and alders that are coming off the lake at present. Trout are succumbing to all methods including fly, spinners and worm and there are good reports from bank and boat anglers alike! First up Lee Mitchell from Huddersfield fished the banking on the last day of the Pike season. 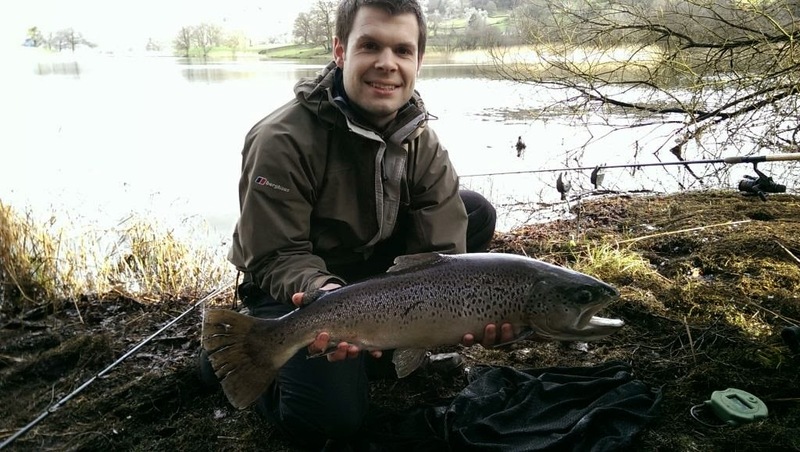 He presented legered Mackerel and was surprised when a 9lb 9oz Brown Trout took his bait. A real brute of a fish which was returned alive to the water. (SEE ATTACHED PHOTO). Fly anglers are also getting in on the action. Jack Greene from Liverpool fished cats whisker from the boats to take 4 brownies in conjunction with a sinking line. Meanwhile Harry Jones from North wales fished nymphs and buzzers from the boats to land 5 brown’s to 2lb on a floating line set up! Unfortunately the next discounted tuition day on Sunday 11th May is fully booked , however there are still places left for Saturday 7th June if anyone is interested in learning to fly fish. The session starts at 10am and finishes at 2pm. The cost is only £10 and participants must phone up and book in advance. All you need is a current EA licence, a brimmed hat and a pair of sunglasses. All the tackle is provided on the day! The last week of the Pike season threw up some nice fish once again. Steve Bosacki and Dan Fois from Huddersfield fished static deadbait from the car park to land specimens of 12lb, 20lb 2oz, 23lb and 24lb 2oz respectively. Big S club member John Ashurst fished lures from the boats and landed Pike of 8lb, 14lb and 17lb. All John’s fish were taken from the boats. Meanwhile Hawkshead Angling Club member John Bradley from Preston had a nice brace of fish from the boats. John landed a 12 pounder on a lure and a personal best snapper of 28lb 2oz, which fell to a static herring deadbait! The Pike fishing is now closed on Esthwaite, however we will, for this year only be opening our doors to predator anglers on 1st June. This will be strictly to day ticket anglers only and permitted methods will include lures and fly. No deadbaiting will be allowed! For up to the minute information please follow us on Facebook and Twitter!